There are approximately 7-8 billion scrap tyres across the globe today and the amount keeps increasing which become a situation that is mirrored in countries around the world. As most countries’ legislation to ensure their environmentally safe disposal comes into force, while the tyre recycling industry is experiencing tremendous growth. Malaysia too, has enacted legislation that restricts or even bans the disposal of tyres in landfills under the Environmental Quality Act, 1974 (Act 127). Eco Power Synergy Sdn Bhd’s mission is to be one of the leading provider of great-value and performance materials produced from recyclable resources. By processing and upgrading the waste from reclaiming raw materials used to produce tyre at the outset, which now able to produce oil and gas that can be used to generate power, thereby reducing demand on energy sources of petroleum or natural gas. Eco Power Synergy Sdn Bhd also emphasis on Ecologically Sustainable Development which it can be achieved through the different approaches exist in the industry. We seek to implement and develop the recycling industry by stepping aside from traditional scrap tyre application. Is Eco Power Synergy Sdn Bhd’s vision that all scrap tyres should be recycled in the environmentally and economically most beneficial way. Waste recycling plants provide immediate resources for raw materials together with ridding environmental surroundings of ugly heaps of trash. Almost everything can be recycled nowadays which range from organic wastes up to the more stubborn inorganic wastes. The entire process of recycling tyres is typically called tyre pyrolysis. It is the most eco-friendly tyre recycling processes available. The meaning of the pyrolysis project is converting waste tires into useful resources, such as fuel oil, carbon black and steel wire. The tyres are shredded towards the desirable size. Then this steel and fibre are carefully removed to remain with all the rubber only. The rubber pieces are then heated to extremely high temperatures in the controlled environment. The emitted gaseous compounds are extracted and further processed to be utilized as fuel. The steel wire can be recycled to the smelting plant to produce new steel products. The pyrolysis refers to the process during which the scrap tyres are pyrolysed into oil under high temperatures of 300 to 700°C in the oxygen-free reactor. The final products include pyrolysis oil, carbon black and steel wire. The pyrolysis oil can be widely used as fuel oil in industries such as steel and iron and boiler factories, ceramics as well as generating power. Pyrolitic carbon black is produced as a solid by-product of waste tyre pyrolysis process after the gaseous fraction have been recovered and condensed into liquid fuels. For every 1 ton of tyres processed, approximately 300 kg to 350 kg of crude carbon black is produced as a by-product. 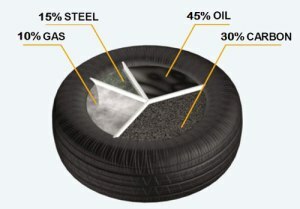 Traditionally, carbon black has been used as a reinforcing agent in tyres. Today, because of its unique properties, the uses of carbon black have expanded to include pigmentation, ultraviolet (UV) stabilization and conductive agents in a variety of everyday and specialty high performance products. Recovered Carbon black from tyre pyrolysis is proven more beneficial than they are wasteful of resources.